Some of our newest and youngest community members will discover the joy of reading, with Blackburn English Language School (BELS) holding a book giveaway assembly for their students on Friday 11th December 2015. EACH’s Health Promotion team has been working with BELS as part of the Health Promoting Schools Program. The Health Promoting Schools model is based on the social model of health, that assists the school to meet the many needs that these families have when they first come to Australia. As part of this program EACH has provided funding for the Books in Homes initiative, which provides three books chosen by each student that they get to keep. 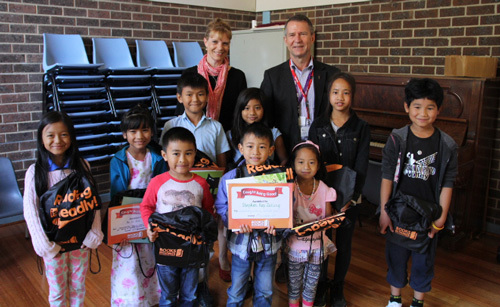 The BELS student community is made up of children newly arrived in Australia who have limited or no English. Around 80% of the children arrive from refugee camps. Many have had little formal education. The aim of the project is to encourage children to read in their own time. In providing students the opportunity to choose books reflecting their interests, anticipation is created, making the act of reading and owning a book personal and special. “This opportunity allows for books-of-choice in low socio-economic homes that can be a powerful influence on children’s attitude to reading, while also supporting schools to increase student attendance,” said Peter Ruzyla CEO of EACH Social & Community Health. For more information about the project, please contact Liz Senior, Senior Health Promotion on 03 9757 6206 or at lsenior@EACH.com.au.